3-D printing is starting to become quite a commercially viable technology. 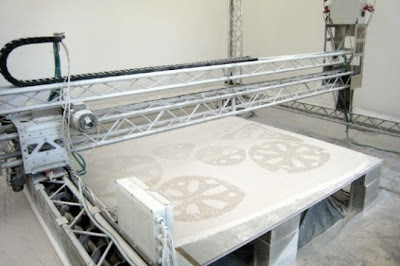 And now a smart-thinkin' dude named Enrico Dini has raised the game bigtime with the D-Shape printer: a large-scale printer that consumes sand and along with magnesium-based glue, can churn out furniture, sculpture... and even entire buildings! Dini suggests that in the future, his technique could be used to quickly establish a base on the Moon by supplying it with native lunar dust and building required structures from there, instead of hauling material from Earth. Forget the house. Lets use it to print set pieces and props!